For a full list, visit admissions.uiowa.edu/200. In 1855, the University of Iowa became the first public university in the country to admit women and men on an equal basis. To this day, the will to break down walls and challenge ideas continues to define what it means to be a Hawkeye. 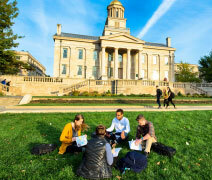 The University of Iowa provides an engaging interdisciplinary learning environment that encourages exploration, critical thinking, and creativity. 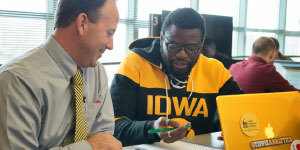 Expert faculty members work directly alongside undergraduates on projects and research, helping Hawkeyes get involved and gain crucial hands-on skills in their desired fields. The University of Iowa is home to one of America’s foremost comprehensive medical centers: University of Iowa Hospitals and Clinics. Ranked on U.S. News & World Report’s “Best Hospitals” list for 28 consecutive years, UIHC provides a unique academic resource for students. UI students can work with patients directly across every discipline of health care, developing practical skills that set them apart in a competitive job market. Medical programs at Iowa are grounded in a consistent history of leadership. The original medical college at Iowa was not only a founding member of the Association of American Medical Colleges but was also the first public medical institution to admit women—and from its very first class, no less, in 1870. Since then, that pioneering spirit has spread to programs in Dentistry, Nursing, Pharmacy, Public Health, and wide variety of other medical disciplines. What does this mean for Iowa students? Exciting career opportunities upon graduation. Ninety-nine percent of graduates in Nursing and 97% of Pharmacy grads find a job or are accepted to advanced education programs within six months of earning their degree. Seventy-eight percent of dentists, 77% of physician assistants, and 53% of physicians currently practicing in Iowa are UI graduates. Medical employers know that UI grads are trained to excel. 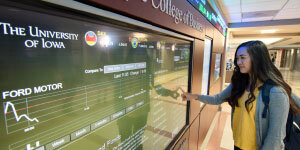 Iowa combines hands-on practice with pioneering interdisciplinary research. That means students can get involved in any facet of the medical world, whether they’re interested in patient care or discovering new treatments. The two sides work together at Iowa, as revolutionary methods created on campus often see direct use at UIHC, allowing innovative approaches to have a direct, positive impact on patients. Research centers like the Iowa Neuroscience Institute, a collection of more than 100 faculty members across 26 disciplines dedicated to fighting various cognitive disorders, provide a phenomenal platform for UI undergrads. In fact, nearly one in three undergraduates are currently involved in hands-on research, making active contributions to new treatments for cancer, diabetes, and visual impairments, among many other conditions. Between expert faculty instruction, working with research centers at the front of their fields, and hands-on learning opportunities, UI students in medicine have unparalleled resources at their fingertips.